You feel loneliness when you have not felt affection. Loneliness works like hunger. If you don't eat, you feel hunger. Similarly, if you don't feel affection, you feel loneliness. The longer it has been since you've eaten, the stronger hunger becomes. Similarly, the longer it has been since you've felt affection, the stronger loneliness becomes. 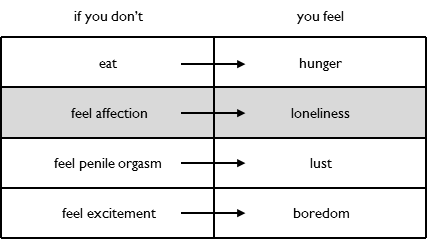 Hunger, loneliness, lust and boredom all function in the same manner. If you don't do or feel enough of the left column above, then you begin to feel the right column. And the longer it has been since you have done or felt the left column, the stronger the right column becomes. The right column stops when you do or feel the left column again. You cry if you are lonely. Crying means tears running down your face, not wailing or other vocalizations. When you become moderately lonely, you will cry - unless you suppress it, which often occurs. You only cry if you are lonely. Only loneliness causes you to cry. If you are crying, you are lonely. If you are not lonely, you will not cry. Other emotions can cause you to release previously suppressed crying. When the urge to cry arises, it is often suppressed because it suggests emotional instability. You don't even realize that you suppress crying until you release it later. When you release it later you can see the behaviors that help you suppress it. While you are crying, your breathing is labored because tensing your diaphragm helps suppression. And your chin trembles because tensing your facial muscles helps suppression. Suppressed crying is released later when you feel any strong emotion - positive or negative. The release of suppressed crying when feeling a positive emotion is called happy crying. Oscar winners often cry because they feel strong pride. Crying is good way to monitor loneliness. If you are unhappy, it is not easy to pinpoint which negative emotion you are feeling. However, that is not true for loneliness. If you are crying, you are lonely. Even if you are happy crying, you are lonely. The other negative emotions do not have such a clear indicator. If you do cry once a week or more, you are lonely and therefore unhappy. If you keep increasing how much affection you get each week, you will eventually stop your crying and loneliness. Loneliness is probably the most common cause of unhappiness. Most people are lonely. Crying is the best evidence. Most people cry in tear jerker movies. They wouldn't be crying is they weren't lonely. If makes sense that we are generally lonely. In the distant past, we spent most of our time with our families - our best source of affection. Now we spend most of our time away from our families. We do not understand that affection is as important to your happiness as eating. We do not openly think about whether we are getting the minimum amount of affection required to avoid ongoing loneliness. Instead, there is a tough guy attitude towards affection and loneliness. If you can't suppress these needs or emotions, you are not tough enough to succeed. This attitude is also reflected in the notion that crying indicates emotional instability. While we may not openly acknowledge the importance of affection to avoiding loneliness, our behavior does. The continued growth of pets is the best evidence. There are now more pets than children in the US. Further evidence is the popularity of sitcoms and radio shows. To avoid loneliness you need to actively manage your affection. Loneliness needs to be managed like hunger. You spend time hours each day planning, purchasing, preparing and eating food. If you did not, you would feel hunger. You also need to spend time each day planning, seeking and interacting with familiar people to feel affection. If you do not, you will feel loneliness. Having family meals facing each other, for example, is a particularly good way to feel very strong affection. Pets and familiar television programs can be reliable and convenient sources of affection, but provide only moderately strong affection at best. When someone dies, most people feel loneliness, not grief. Only a few people feel the very strong negative emotion of grief when someone dies: mothers, grandmothers and possibly boyfriends/husbands. Everybody else feels strong loneliness caused by imagining an infinite future without the dead person. While that imagined loneliness is easily stopped by interacting with familiar people and feeling affection, grief never stops. Even when surrounded by family and friends, grieving people feel grief.